The challenge before us, as put forth in the last post, is to deconstruct a classic Peanut Butter and Jelly Sandwich. The idea is to take the ingredients of that well-known comfort dish, and recreate something new with them. When I first approached this challenge, I was a bit at a loss. I did have some ideas, but they weren’t really coming together. I talked with my wife about a few of them, and none of them seemed to impress, either. Part of my dilemma was to decide what part of the meal it would be. My ideas didn’t seem to be substantial enough to make it a main dish, and it was too weird to be a side dish. I mean, what sort of main dish would a PBJ go with? It’s not like picking a good wine for your meal. There are no rules, here. I finally settled on the idea of it being a dessert. That felt right. It would work. But then, how to do it? Nothing I thought of really worked in my head, and nothing seemed to appeal to my wife, either. Then she mentioned something about peanut butter cookies. I ran through those ingredients in my head (like peanut butter, of course, and flour and egg for the bread), and it started to snap into place. A dessert, based on the cookie, with a glaze of the jelly on top! Then I started thinking about chocolate. I don’t usually add chocolate to my PBJ’s. But, I thought, it’s my dish, I can add to it as I please. I decided to do some sort of chocolate crumb crust below the cookie. Jodi suggested a chocolate sauce on top, which I, initially, resisted. But, who can resist a chocolate sauce for long? I mean, get real! It really turned out to be the perfect topper. In the end, it really did taste great, and evoked the flavors of the original, while taking it to a new place. That’s the goal of deconstruction, isn’t it? A success! Plus, I learned to pay more attention to my wife! I started out by lighting up the coals. Once they were getting a little white, I put some on the Dutch oven lid to begin preheating it. Actually, I did that part somewhere in between working on the ingredients. The next step is to chop up the graham crackers. I actually used a blender. Jodi mocked me, because I usually try not to use electrical appliances when I dutch oven. She thinks that’s silly, but since they are not allowed in cookoffs, I try not to use them at home as much as possible. But this time, I was going to be using a table mixer for the cookie anyway, so I figured I use a blender for the crackers, too. 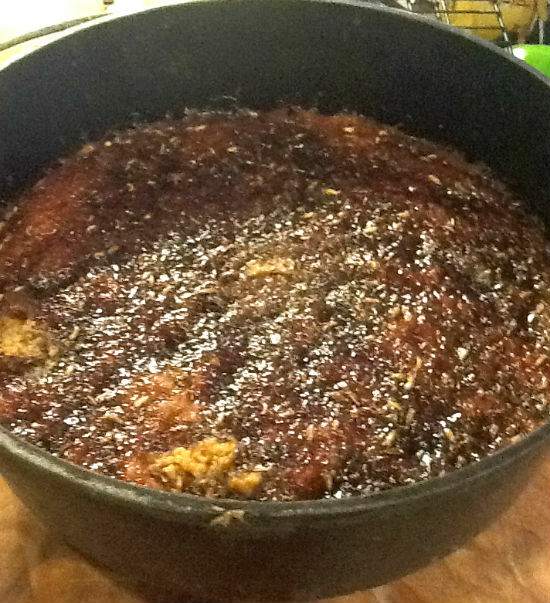 I mixed in the other ingredients and pressed the resulting mud into the bottom of the 10” Dutch oven. Then, I mixed all of the other ingredients in the table mixer, whipping it up nicely. I spread that over the crumbs, being careful not to disturb that level as I did. 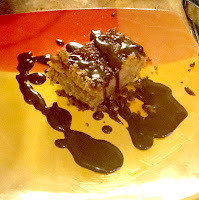 Finally, I mixed the topping ingredients, and spread that in a thin layer over the top. 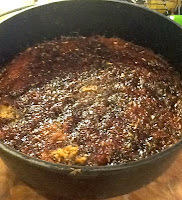 By this time, the lid was pretty hot, so I went out and adjusted the coals, top and bottom, and began baking it. I didn’t know what to expect, so I checked it about every 10 to 15 minutes. It ended up baking for about a half hour to 45 minutes. The center was the last part to cook, and it was pretty jiggly right up to the end. When that was pretty solid, I took it off the coals and brought it inside. Then I went on cooking the rest of the meal, which was a basic chicken and potatoes pot with biscuits on the side. When it became close to time to serve the dessert part of the meal, I still hadn’t decided on the chocolate sauce. Jodi made the choice for me and cooked it up. If I had done it in the Dutch ovens, I would have used pretty much the same process she did, but simply done it in my 8” Dutch oven. I would have added the two ingredients and stirred them until the chips melted and it all blended with the cream. Easy, quick, and delicious. As I said, it turned out to be the perfect topping! Really, the dessert was great. It really was a perfect combination of the flavors of the traditional peanut butter and jelly sandwich, while adding the chocolate and the other flavors to take it in a new direction. So-- That's my entry in the challenge! I hope some others are up to it as well, and I'm eager to see what comes out of it all! A new challenge will be coming soon! It IS true that I don't normally put chocolate on my PBJ sandwiches. I don't also spice up my jelly. However, the rules of our deconstruction challenge do allow for adding stuff in. Go for it! Wow! Either we need to move by you or you guys move by us so we can benefit from your wonderful dutch oven cooking!